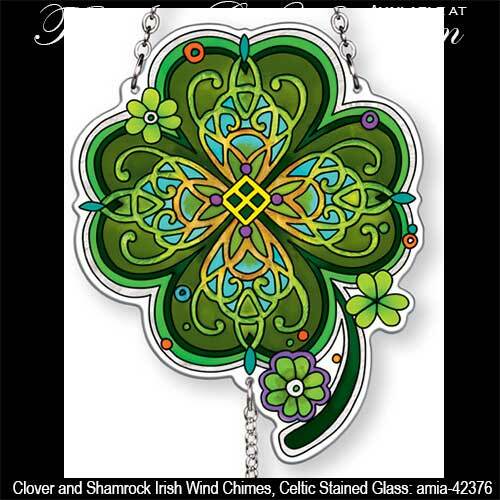 This Irish wind chime features a large stained glass clover with a Celtic knot motif, along with shamrock accenting. Sorry, this clover wind chime is now sold out. 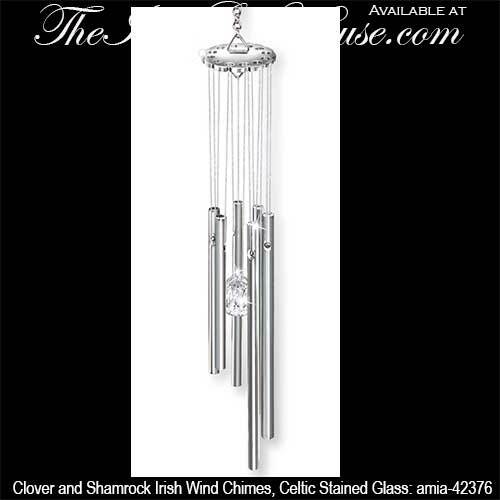 This Irish wind chime features a Celtic inspired four leaf clover along with shamrocks. The distinctly shaped clover wind chime is hand crafted glass that has been individually cut out with water thus leaving the edges of the stained glass smooth and polished. The stained glass sun catcher measure 4” wide x 16” long, and it is further enhanced with a genuine hand faceted crystal ball hanging inside of the aluminum chimes. This Irish garden decor is ready to hang with the included metal chain and it is gift boxed with Celtic knot and shamrock history cards, complements of The Irish Gift House.